My friend has an outspoken self-regard for his golf game, a character trait that only grew worse after Brandel Chamblee casually asked if he’d played in college. He’s also a profound cheapskate, taking the back route to the parking lot to avoid tipping a club-cleaner. Thus, if he were ever to get an ace at one of the media events in which we occasionally play – – forcing him to choose between bragging about the shot, or shut up to avoid paying for a 70-player round of drinks – – my pal would spontaneously combust. There’s nothing in the Rules of Golf, of course, that requires a player to buy drinks for the clubhouse after a hole-in-one, or even spring for the foursome. And yet, the custom has evolved into an enduring tradition, albeit one that can get awfully expensive. For the vast majority of golfers, a hole-in-one is a once-in-a-lifetime achievement that, well, never happens. According to the Philadelphia-based US Hole In One – – which provides prize insurance for tournaments and outings – – the odds of an amateur making an ace on a par 3 are about 12,500-to-1, or the equivalent of 3,125 rounds. Indeed, to hit a golf ball 150 yards and have it roll into 4.25-inch cup is mostly the result of dumb luck. My only ace, for example, happened even as I was grumbling about a pushed shot, only to see it hit the fringe ten feet right of the flag, bounce hard left and rattle into the hole. Dumber luck. Skill, nonetheless, can be a factor. The odds of a PGA Tour player making an ace are a mere 2,500-to-1, or once in only 625 rounds. Yeah, those guys are good. While rare for an individual golfer, aces are fairly common across golf. Indeed, a typical course with four par 3’s, hosting an annual 40,000 rounds, will see almost 13 per year. And as US Hole-in-one points out, with a typical tournament field of 100 amateurs, the odds of an ace is only 1-in-32. Numbers don’t lie but golfers just might, either as a boast about something that didn’t really happen, or to deny there was an ace to avoid paying for drinks. First, golfers need to understand what constitutes an ace, which isn’t always as obvious as one may think. For example, most players know that if you hit the first shot into the pond and then fly it into the cup with a second, it’s not a hole-in-one, but instead is a three. But what many don’t know is that if you hit out of turn in match play, an opponent has the option to cancel a shot – – good strategy if it’s at kick-in distance – – and have you hit again in the correct order. In this instance, if the second shot rolls in, it’s an official hole-in-one. Likewise, if there’s a local rule that allows you to replay a shot that’s hit, say, a power-line, a second try that goes in is also an ace. No matter how the hole-in-one happens, a celebration is in order. Dance, jump up and down and make it a show, so long as the screams of joy don’t bother players putting on the last green. Whip out the iPhone and have partners take photos and videos of you removing the ball from the cup, and immediately post it on Facebook and Instagram. You deserve to boast. 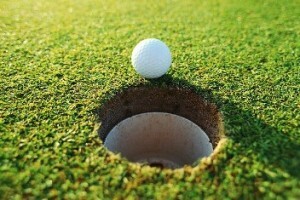 Next, do not put the hole-in-one ball back into play, because the Golf Gods will ensure you almost immediately lose it. Mark it with the date, have friends sign it, and keep the ball in a safe place, so it can later sit on a shelf or even a trophy. And be sure to finish at least nine holes, which will make the hole-in-one official. Sign your scorecard and have your playing partners do the same. Next be sure to check in with the pro shop, might help commemorate the accomplishment. “We offer to set up the purchase of a plaque commemorating the event,” says Rod Ghilarducci, Head Golf Professional at the public Peacock Gap Golf Club in San Rafael. Still other public clubs will sell or give the golfer a flag with the number of the hole on which the ace was scored. A simple Google search reveals any number of places in which to register an ace, including with the World Golf Hall of Fame, the PGA and the Golf Digest Hole-in-one Club (gdacers.com), the latter of which will sell you a certificate for $9.99. You can also call the local newspaper, many of which list local aces in the sports pages. Although the origins of the custom of buying post-ace drinks for the house is unknown, some suspect that private clubhouses promoted the tradition, simply to increase liquor sales. More likely is that exuberant golfers, way back in the Hickory Age, enjoyed buying a round for friends and nearby strangers, simply because it felt good. Because a hole-in-one is something to celebrate, amateur and pro tournaments frequently offer prizes for one, including cash and new cars. To cover a $20,000 Honda Civic for a 72-player field, US Hole-in-one charges a modest $341, money well-spent by an event organizer. While it’s rare for an American public links golfer to buy personal hole-in-one insurance, it’s more common in the UK and in particular Japan, where many give elaborate gifts to friends and family after making an ace. If you play at a public course and have a large group that gathers on a regular basis, tradition dictates you buy for everyone, even though no one will likely hold you to it. Most private clubs try to protect members from their own selves, not always with success. At the Marin Country Club in southern Novato, all members, including spouses and children, are eligible for a “free” hole-in-one drink, be it a beer, cocktail or Arnold Palmer. Each member receives a $3.50 charge on the next statement, including the person who made the ace. And it funds what often turns into an impromptu party. At the Red Ledges Golf Club, there is no hole-in-one program. “As you might guess,” explains Johnson, “not all that many people in Utah drink.” Were he to make a hole-in-one in Heber City, even my skinflint friend might spring for root beers for the house.